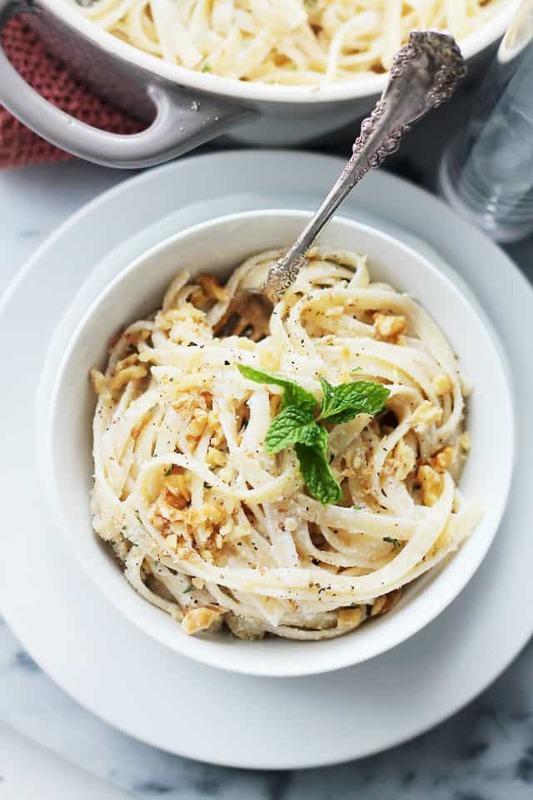 Creamy Pasta with Ricotta, Mint and Garlic Sauce – Quick and easy creamy pasta dish with ricotta cheese, garlic, mint and walnuts. This is perfect for any night of the week! Hi, friends! TGIF! THIS recipe, my dear lovelies, is a guest post for my dear friend Erin at Dinners, Dishes, and Desserts! YAY ME! I ♥ Her! Also?? Happy 1st day of Spring!! You guys, that’s SO exciting considering all the snow and cold that this winter brought with itself. So annoying! AND? I’m officially an arrogant soccer mom. Yesterday it was 35-degrees, it was windy, it was cold and icy, buuuuut THIS mom was out there on the fields screaming out at her daughter every time that the ball was in her possession. I am obsessed! GO WILDCATS! 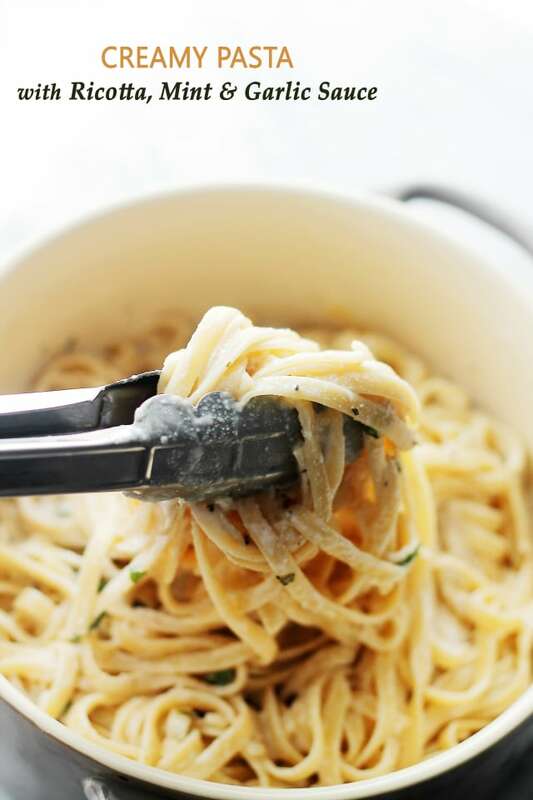 Ahem… calm down… think about pasta… creamy and garlicky… and? tranquility enters. Had you asked me fifteen years ago what my favorite food in all the land was, I would have loudly proclaimed ANYTHING, BUT PASTA! I blame it on the red tomato sauce. Don’t get me wrong, I do love spaghetti sauce, but not that runny and thin juices-of-tomatoes type of sauce. Capisce? However, an introduction to white creamy sauces was all I needed to turn that around. And not the jarred alfredo sauce… uhm… no way. Homemade, light, bright and garlicky is the way to my pasta loving heart. 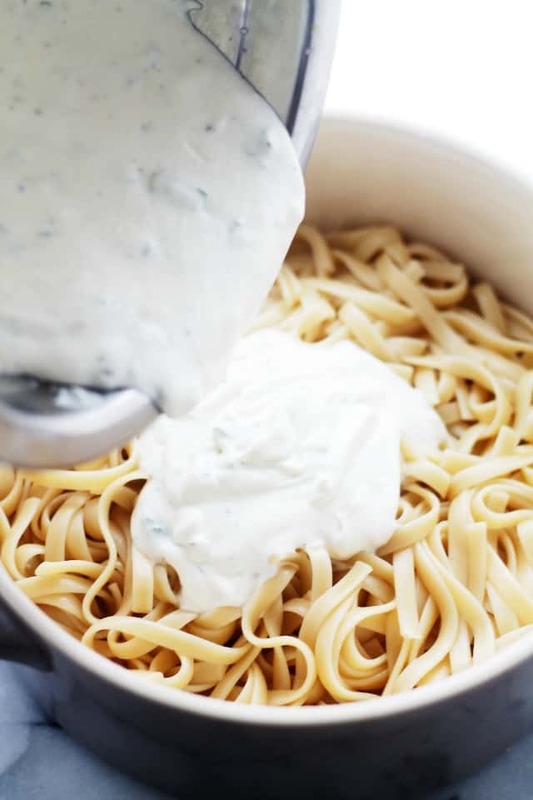 And the way to this Creamy Pasta with Ricotta, Mint and Garlic Sauce is at Erin’s place! FOLLOW ME! I have made this three times; first time with chicken souvlaki, the second with lamb kabobs and the third with oregano shrimp. I serve with my take on a greek caprese, tomoatoes, feta cheese, kalmata olives, fresh oregano and a drizzle on lemon greek olive oil. I don’t like tomato sauce so I know I would love this and want to eat it all the time. Going to check out the recipe now! I bet the Mint must give it a nice flavor, never thought about that.